This image was created in the winter of 2010. 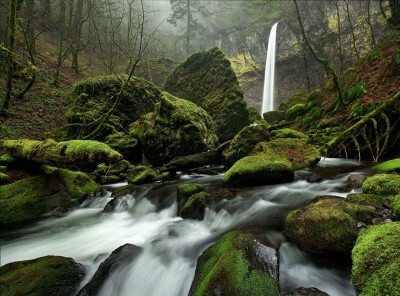 I feel fortunate to have such an amazing visual resource as the Columbia Gorge within an hour of my home in Portland, OR. Elowah Falls is a short hike from the highway and a bit of a scramble down to this vantage point. Winter hikes provide solitude and a bit of drizzle adds to the experience. For this image I carried my waders to the site and stood in the ice cold water until I got the composition I wanted. This is a four image panorama. Each image was taken vertically and they were merged horizontally. My camera at the time was a Canon 5D, with EOS 17-40mm lens at 17mm. A polarizer was used. ISO setting was 320; exposure F16, 0.7 seconds.